BIOSTAR has officially unveiled their upcoming 100-Series powered GAMING Z170X4 motherboard which will be powering the 6th generation Skylake processors. Intel is going to introduce their Skylake processors at IDF ’15 with launch slated in September but motherboard manufacturers will be displaying several concepts and designs during Computex 2015 which begins in the first week of June. Revealed by 4Gamer as a part of an official press release by Biostar, the company showed off their GAMING Z170X4 motherboard which as the name suggests, features the Z170 chipset and the LGA 1151 socket for the next generation Skylake processors which will hit retail in September. The processors line will include a mix of enthusiast 95W Unlocked chips and 65W – 35W mainstream chips available at different prices. 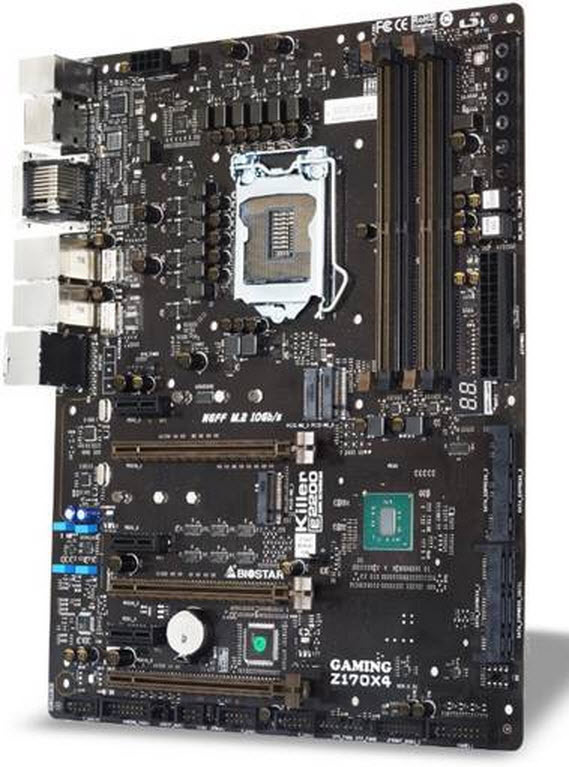 As we can see from the motherboard layout, Biostar hasn’t yet shown off the final design since the motherboard is bare of heatsinks and all the necessary materials to make it a part of the final release but the design scheme does show that Intel’s AIB partners do have 100-Series chips at hand and we have already seen listings of Z170 boards from ASRock, Colorful, EVGA and ASUS during the last few months. Coming to the specifications, we are looking at 12+4+2 phase power design and an 8-Pin power connector that will juice up the LGA 1151 socket. The reason why we will get to see a large number of VRMs and beefy power supply back on the board is due to the fact that Intel is going to get rid of the FIVR (Fully Integrated Voltage Regulator) off from their chips and Broadwell will in fact be the last of the chips to feature it. This will allow a refocused design to make the chip pump out less heat compared to its predecessors. Just beneath the power connector, we can note the voltage controller chip. The socket is surrounded by four DDR4 DIMM slots on its left side which can support overclocked memory sticks and capacities up to 64 GB (16 GB per channel). Expansion slots on the motherboard include three PCI-e 3.0 x16 and three PCI-e 3.0 x1 slots. There are also three NGFF M.2 slots which allow MSATA SSDs and other connectivity devices with transfer speeds of up to 10 GB/s. Just like previous designs, ASRock will be adding that extra OOMPH with their boards by providing Killer E2200 LAN support and a fully isolated audio PCB with quality components as a part of their Hi-FI design. On the storage side, we are looking at 6 SATA 6 GB/s ports and three SATA Express ports. It’s up to users to use these ports as normal SATA or SATA-Express as they deem suitable. two USB 3.0 and two USB 2.0 ports can be found at the bottom of the board. Next to the ATX power connector, we can found some overclocking goodies that include BCLK adjustment/ voltage adjustment switches, On/Off, Reset buttons and a BIOS Debug LED. Since the I/O connectors are facing the other side, we can’t really tell how many USB ports will be featured on this board. The Skylake Z170 chip can be seen in bare and takes a small amount of space compared to previous chipsets. Regardless, Skylake motherboards will feature optimized performance and stability for the upcoming processors and we expect to see tons of design during Computex 2015.